Whenever we feel stress, whether due to the frustrations of normal daily life as a caregiver or the result of events out in the world over which we have little or no control, the benefits of simple breathing techniques can bring instantaneous relief. The power of this relief isn’t just in our imagination – the measurable benefits of conscious breathing practices on health and wellbeing, creativity and concentration, energy and strength, and even PTSD and mental health, have been studied and confirmed by researchers from Harvard, the Cleveland Clinic, the National Institute of Mental Health, the U.S. Military, the Veterans Administration and many others. Any wonder, then, why I teach breathing techniques in my programs, and suggest pausing for a slow, deep breath regularly in this blog? From both personal experience and feedback from readers and clients, I know without a doubt that simple mindful breathing can be one of the best self-care tools, free or otherwise, in a caregiver’s toolbox. Did you ever really consider how important breathing is? Most people don’t, since it’s something they do all the time without having to think about it. Paying attention to your breathing is an important part of living consciously and purposefully. It takes twenty-eight days to make a habit, so you can start today with practicing the new habit of life-enhancing breathing. Stop! Breathe! Focus! Whenever you feel stressed, worried, upset, and so on, focus your eyes straight ahead or tilt your head back, stretch your arms open wide, take a slow, deep breath, and say aloud, “I am coping with my life with open arms.” Feel your chest expand, your back muscles stretch, and your entire upper body open up. Repeat this process and the phrase three times. Then allow yourself to refocus on the issue that had stressed you or worried you. Notice the shift that occurs in how you look at the situation. While breathing doesn’t change the situations you’re dealing with, it does give you an opportunity to change how you respond to them, and it absolutely does have an impact on your overall health and vitality. Put “breathing breaks” on your calendar so you can’t forget them or shrug them off as something you don’t have time for. As you begin to count on the relief they bring even when you’re not particularly stressed, you will find that you rely on them as your go-to first response to hundreds of challenges every week. Remember also that you do not have to go it alone! 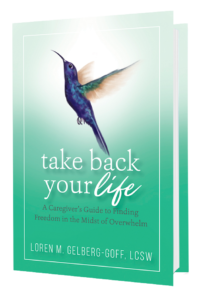 Take a half hour or so to use my Caregivers Step-By-Step Guide and audio, to get some clarity and begin to shift your mindset. 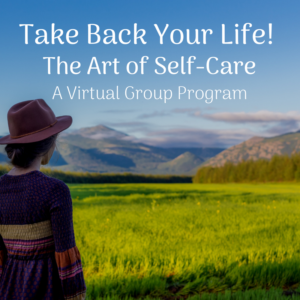 You can find that freedom in the midst of the overwhelm…really! Leave your comments, questions or concerns below… I look forward to hearing from you.